I learned Racket after 25 years of mostly using C and C++. “All the parentheses” was actually not a big deal. Instead, the first mind warp was functional programming. Before long I wrapped my brain around it, and went on to become comfortable and effective with many other aspects and features of Racket. But two final frontiers remained: Macros and continuations. I found that simple macros were easy and understandable, plus there were many good tutorials available. But the moment I stepped past routine pattern-matching, I kind of fell off a cliff into a terminology soup. How do I write a non-trivial macro? 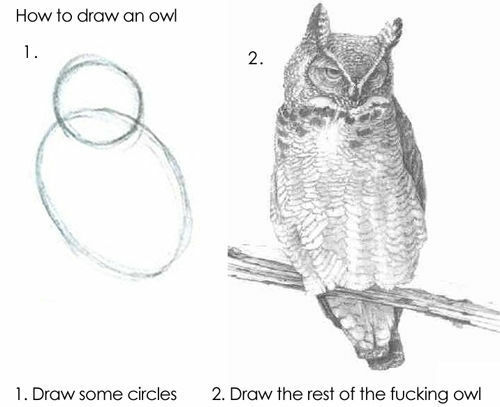 It felt like the instructions to draw an owl. I marinaded myself in material, hoping it would eventually sink in after enough re-readings. I even found myself using trial and error, rather than having a clear mental model what was going on. Gah.